Kia brings up a new model Kia Cee'd GT Line 2016 to its lineup. It is a compromising model between the sporty Cee'd GT and the regular model. It is also the company's powertrain innovations for the European market. It is one of the gorgeous model in the cee’d lineup. 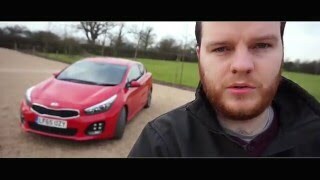 Let us have a close look at the reviews of the Kia Cee'd GT Line 2016 and get to know about the gorgeous model. The interior of the Kia Cee'd GT Line 2016 is as enormous as the other Cee’d models. It is upgraded with a higher quality, sportier ambience, inspired by the cabin of the current turbo-powered GT models. It brings up a classy, new grey, white and black upholstery with grey stitching; a series of GT Line logos throughout the cabin; and the same piano black and leather steering wheel and aluminium alloy pedals fitted to Kia's high-performance GT models. The dashboard is also equipped with a new aluminium start-stop button. In all, it has as elegant features as the others. The Kia Cee'd GT Line 2016 has superior exterior in the Cee’d GT lineup. In the front, it has ice-cube LED daytime running lights and deeper bumpers surrounding Kia's hallmark 'tiger-nose' grille. At the rear it includes a wider GT bumper and twin exhausts, while the Sports wagon is fitted with dual exhausts and a subtle rear diffuser. It is also aided with eye-catching side sill mouldings and rear LED light units, and a stylish new 17-inch alloy wheel design. With all these feature, GT Line model blends the looks of sporty cee'd GT and versatility of the conventional Cee'd, both inside and outside. The Kia Cee'd GT Line 2016 is powered with the 1.0-litreT-GDi engine which produces 120ps and 172Nm torque, and has been engineered to deliver lower CO2 emissions than the 1.6-litre GDI engine found in other cee'd models. The 1.0-litre cee'd GT Line is also equipped with Kia's fuel-saving ISG system as standard which improves emissions and fuel economy, and is available with a six-speed manual transmission.